I’ve been enjoying second semester so far. In geometry, we just finished up the unit on triangle congruence. I felt like it was kind of rushed, but progress was definitely made. We revisited proofs after a brief introduction back in October, and I enjoyed seeing kids reasoning again. One practice that I used several times was having small groups write out proofs on the whiteboards and then sharing them with the rest of the class. I asked each person to contribute one thing to the board (the diagram, marking the diagram, writing the congruence statements, using cpctc, etc) which was a good way to make sure no one was dead weight. One thing I’d want to improve is what the kids in the. audience are doing while the other groups share. Too many were tuned out and I felt like I was the only one listening and asking questions. However I think everyone was listening when one student ended up saying FU is congruent to FU. I’m now teaching stats in FST. The curriculum is… lacking to say the least. 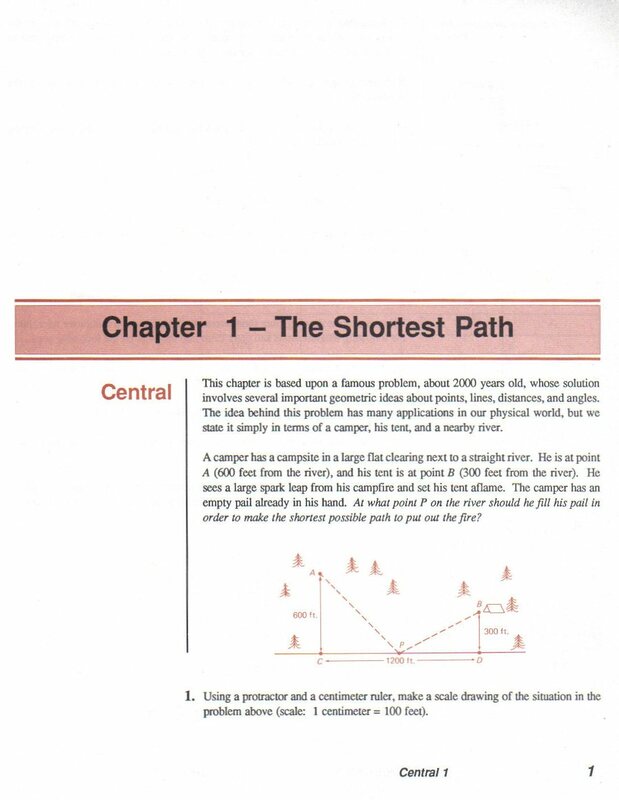 I feel like stats could be so cool, but these crappy worksheets with blurry images are pretty uninspiring. My mentor said she’d help me come up with some cool stats projects, so I have to remember to follow through on that. Speaking of curriculum, during the last inservice, the math department met and had a pretty kickass discussion on equity in our curriculum. Nothing concrete came out of it, but it was refreshing to hear everyone’s ideas, and I was glad to learn that I’m not the only one who thinks much of our curriculum is really out-dated, non-rigorous, and inequitable. I really do feel like I’m teaching something that was written in the late 80s or early 90s. I can’t relate to it all, and I sympathsize with my students when they can’t either. So there’s much work to be done, but so far second semester has been shaping up nicely. It’s frickin cold out and we won’t have any vacation until spring break, but I’ve been enjoying every day so what more could I ask for? I’ve been feeling pretty lucky lately. My goal for my Geometry classes today was to be as mathematically productive as possible, given that it was the last day of classes before break. The plan was to review the last assignment, take the quizlet (what my department calls formative assessment), do an extension problem, then make a Koch Snowflake if there was still time. The extension problem was the “Shortest Path Problem” which I highly recommend. It turned out to fit perfectly with what we’re learning right now. It also sparked some rich conversations and good reasoning, and everyone could at least venture a guess, even if they didn’t really know what to do to figure out the exact shortest path. This plan was carried out differently in each of my three Geometry classes. In the first class, I reviewed several problems and concepts, kids followed along, asked questions, the usual. They took the quizlet. I passed out a half-sheet with the scenario typed out on it. I didn’t include a diagram, thinking that the kids should make the diagram. That was a mistake because the wording isn’t exactly clear, so some kids drew the tent and camper on opposite sides of the river and all sorts of random things. So I had to draw the diagram up on the board for everyone, which slightly killed the magic, but at least we were all on the same page. A few kids calculated the distance of a path, but not the shortest, and then wanted to be done. I needed a way to motivate them to keep working. In a rare moment of brilliance, I decided to keep score. I announced “Jesse found a path that’s 1,518 feet, can anyone beat that?”. Then I’d write the student’s name and their shortest path on the board. It became a competition to see who could find the shortest path. I let things linger too long in my first class because a few students were really getting into it and asking wonderful questions like, “how do you know that’s 450 feet” and “can you show me how you got that”. So unfortunately several kids had checked out, but at least everyone did something with the problem. In my other two classes, I skipped the homework review and went straight to the quizlet because there was no way they were going to sit and listen to me blah blah blah about their homework problems on dilations and scale factors. In my first afternoon class, student behavior dictated that decision. In my second afternoon class, I asked them what they wanted to do, and almost everyone said, “let’s just take the quizlet”. So in those classes, there was plenty of time to do both the shortest path problem and the Koch Snowflake. This time I just asked them to read the problem on their own, and then I read it aloud and drew the diagram as I read so everyone started out with the correct diagram. In one class several kids said they didn’t know what to do to get started, so I said “guess and check” or “if you were the camper, where would you go if you wanted the shortest distance”. This was an excellent starting point for those kids. The snowflakes were fun too. 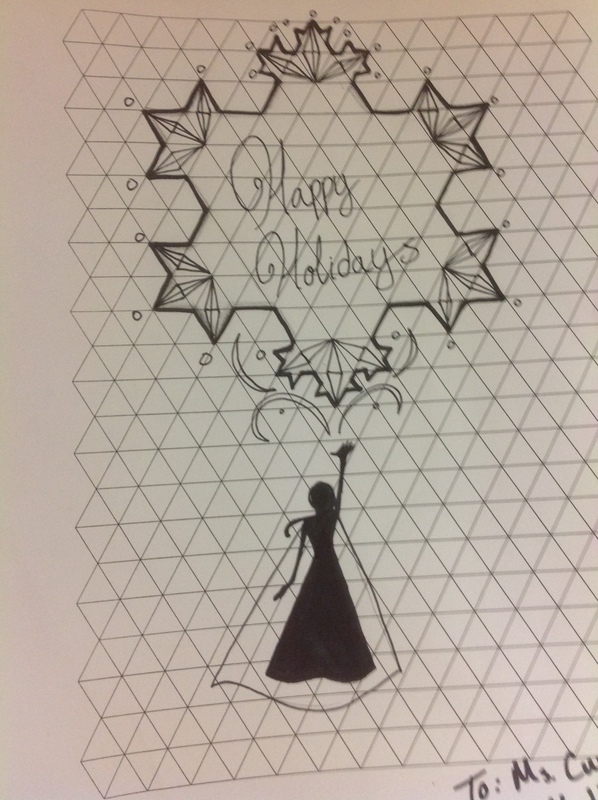 We saw the Sierpinski Triangle this year, so I brought that up again as a reminder of what a fractal is, but then said that the fractal they were about to make was going to be more holiday-themed. I gave everyone some triangle graph paper to help them with their triangles. At first I thought maybe I’d have them construct the equilateral triangle, but using the graph paper was a good call. In the fall I will be one of four new math teachers in my department, which is pretty unique. For two of us, it’s our first year teaching. There are five returning math teachers, which brings our department total to nine. I’ve met everyone except for two of the other newbies, and I think it’s going to be a really great group. My school has an AB block schedule with five blocks per day, and every other day the department has a common planning time, which is so awesome. I interviewed at a lot of schools this spring, and a common planning time was rare, so I lucked out on that one. I will definitely appreciate being able to plan and reflect with my coworkers regularly. I’m teaching two classes this year: Geometry and Functions, Statistics, and Trigonometry, also known as FST. The other new teachers and I were presented with the four scheduling options, and the Geometry and FST schedule was my first pick, so I was happy about that. The district is transitioning to Big Ideas Math (the middle school and Algebra classes already use it), and this year we are getting the Big Ideas Geometry book. I used Discovering Geometry while student teaching and thought that it was a good text, but I have absolutely zero knowledge about the Big Ideas approach. I’d never even heard of them. Do any of you use Big Ideas? What do you think? What have you heard about Big Ideas? Unfortunately, we won’t have the Geometry textbooks and resources until late July, so that makes planning a bit difficult. Luckily, I taught Geometry while student teaching so I have a base to build on. FST is an interesting class. After Geometry, there are two possible tracks. A student may take Advanced Algebra, and then likely continue on with Pre-Cal and then AP Calc. The other option splits up the Advanced Algebra topics into two classes: Algebra 2 the first year and FST the second year. The purpose seems to be to cover the material at a slower pace, do more review, and cover more topics. So most of my FST kids will be seniors with a few juniors in there too. I’ve already met with the other FST teacher this summer, and he kindly gave me copies of the “text” and has told me about the course in general. I say “text” because there is no official textbook for this course, rather some teachers several years ago came up with their own curriculum for this class, so I have the course notes and homework assignments in a big binder. Fortunately, he also gave me a copy of the Discovering Advanced Algebra textbook so I can use their investigations and such. I will also be scouring the MTBoS for good activities, problems, and investigations. I feel lucky to be in what seems to be a very supportive and collaborative department. My FST coworker and I are meeting again next week, and he seems very open to new ideas and suggestions and genuinely wants to make the course better. I have a good balance of freedom and structure: I can deliver the content in whatever way works for me as long as we teach the same thing at the same time, use common quizlets (the math department’s formative assessment) and tests, and have the same grading policy. The students’ schedules get shuffled around at semester, so some of his students will come to me and vice versa. I would prefer having the same students all year because switching it up will mess up the classroom culture that we’ve worked to create, but oh well. So I’ll be working on FST until late July when the Geometry team starts to get together. Lots to think about!